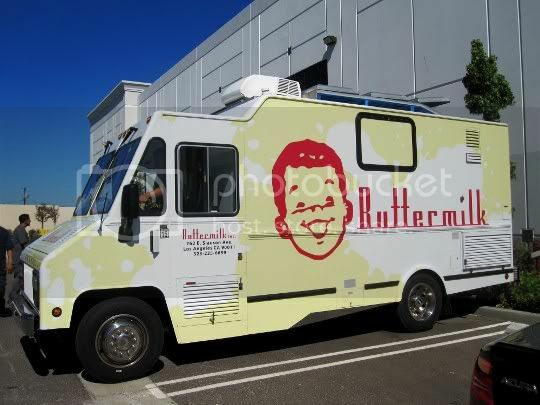 Ahhh, the Buttermilk Truck...the name alone just oozes with thoughts of sugar and butter and more butter. Before actually eating here (or looking at the menu), I thought it was a pancake truck. Pancake balls, pancake sandwiches, other worldly pancake creations. But I was wrong, it's more of a breakfast truck, offering up decadent, rich breakfast-ish food for all three meals. Yeah, McDonald's has nothing on them. The truck's breakfast sandwiches typically come with a choice of meat, so I ordered mine with just egg and cheese. The egg is fried (not scrambled), and you'll have to ask for it well done (unless you like the runny stuff). It's seasoned LIBERALLY with salt and pepper, emphasis on the salt. 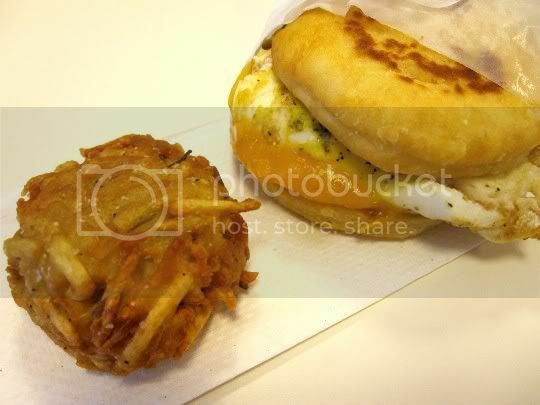 A thick slice of melted sharp cheddar cheese sits atop the egg, and all is housed in a browned biscuit. The biscuit was greasy greasy greasy, and surprisingly a bit tough. It didn't have that sort of cakey, crumbly texture I expected; this was more of a thick pancake-like bread. It tasted good, rich and buttery, but I've had better "biscuits." The hash brown (again not exactly what I was expecting) was like a big golf ball-sized nugget thing of shredded potatoes, garlic, rosemary, and LOTS of salt and pepper...all deep fried into a bite-sized morsel. It was soooooo good! Super crunchy and crisp on the outside, and the center was almost creamy and moist. I'm guessing something like cream cheese or buttermilk must be included in the hash brown too. The one little ball is surprisingly rich, but I could definitely eat more than one! I used to think red velvet anything was overrated; after all, it's basically just red food-colored chocolate. 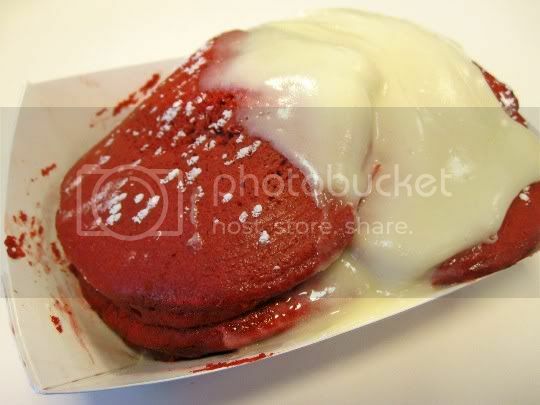 But it's red velvet like this that changes all that. These mini pancakes were perfect: moist, fluffy, chewy, tender...I was so amazed at the texture! They weren't pancake-like at all; they seemed more like mini cakes. They had a mild chocolate flavor, and were sprinkled with semisweet chocolate chips. The pancakes themselves weren't overly sweet, and that's a good thing because the cream cheese frosting served on top of them definitely is! It's the perfect combination. The menu states the pancakes are available filled (I'm not sure with what, the cream cheese frosting is certainly enough), so I'm pretty convinced that these are made from the as-seen-on-TV Pancake Puff. One order is 6 pieces, and that's more than enough. You'll be stuffed after about 2 of them, but they're so addictive you'll easily want to polish off the whole thing! The food at the Buttermilk Truck definitely tastes like old school, real home cooking...I'm talking Paula Deen style. If you so decide to follow this truck, go with an empty stomach, wear loose pants, and eat steamed vegetables for the rest of the day. Seriously. The food is SO rich, I have to admit I didn't feel that great for the next few hours after consuming it all. Don't get me wrong, it tastes GOOOOOD...but it's definitely a once-in-a-while treat. Unless you plan on making sweatpants part of your daily attire. Follow again? Yes, taking heed of my own advice above.